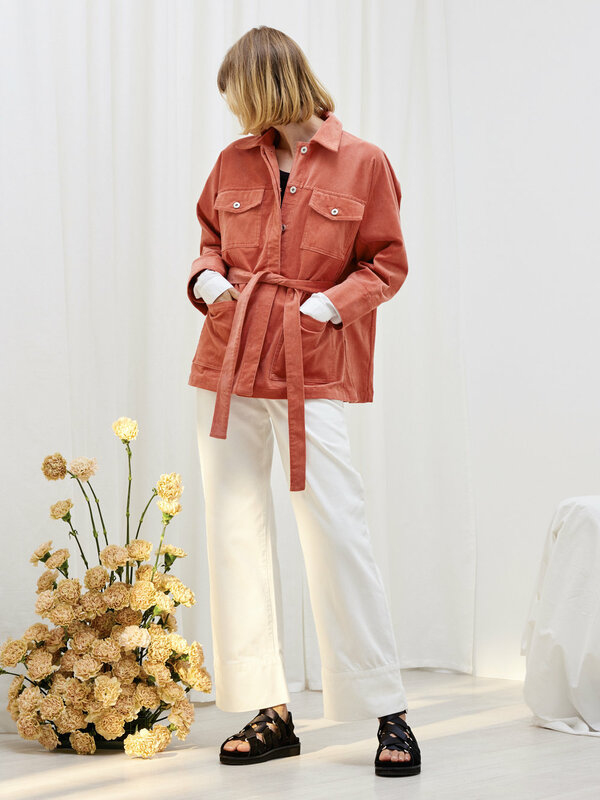 Peach corduroy, classic dark denim, chocolate brown, graphic navy prints and baby blue knits feature in the latest Spring 2018 collection from Kiwi label Kowtow and takes inspiration from colours and shapes of modernist architecture and 70’s industrial design. — Luis Barragan, Mexican modernist architect. Stocked across 250 retailers worldwide including North America, Europe, Asia, Australia this collection looks to be one of the brand’s most international collections to-date. Kowtow’s focus has shifted dramatically since its inception 15 years ago where it worked from a basis of organic T-shirts and draped silhouettes. Today, the brand sits seamlessly in an international context with modern utilitarian pieces that play with proportions and cater to the contemporary woman who understands global trends and carries a sense of understated femininity. The latest collection is no exception and sees the brand release 5 new ethical & sustainable fabrics which include corduroy, fine knit, ecru denim, colour-blocked knitwear and seersucker. The development of each fabric takes around 12 months to design and create from scratch to achieve the desired weight, weave and feel - all adhering to the Global Organic Textile Standard (GOTS) by using approved inks & dyes for printing, dyeing & washing. Stage pant in peach corduroy and Escape crew. The pieces from the collection work across seasons: the rich chocolate brown serves as a reminder that down in the southern hemisphere we’re still braving colder temperatures, but we needn’t miss out on rocking a great pair of cords that nod to a cool seventies minimalist vibe. While crisp white, navy prints, soft blush pinks and structured ecru denim compliment the warmer weather that we’re all looking forward to. Staying true to the essence of the brand, ethical organic cotton makes up the brand’s foundation ‘Building Block’ pieces that can be worn on their own or mixed with Kowtow collection pieces.